Composite photo of the meteor as seen from the Marshall Space Flight Center on May 18, 2010. NASA has put out a call for any meteorites from the event. Full Story. NASA has launched an all-out search for any meteorites thatmay have survived from a bright fireball that streaked over northeasternAlabama last month. And the space agency wants your help. 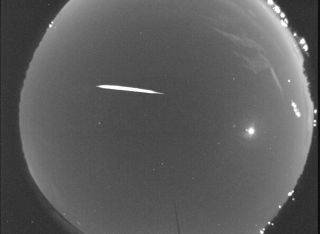 The blazing meteor lit up the Alabama sky on May 18 and wasspotted by all-sky cameras at NASA's Marshall Space Flight Center in Huntsvilleand the Walker County Science Center near Chickamauga, Ga.
"Expert opinion is that one or more pieces of thismeteor survived to make it to the ground as meteorites, and calculationsindicate that the area of the fall lies north of a line joining Woodville andScottsboro," NASA officials said in a statement. NASA is asking residents who saw the meteor, or those whomay have noticed or picked up an unusual rock in the vicinity, to contact theMeteoroid Environment Office at the Marshall Space Flight Center. The meteorwas first picked up at an altitude of 47 miles (76 km) over northwestHuntsville, Ala., moving at a speed of 8 miles per second (13 km/s) toward thesoutheast. It was last visibly detected northeast of Gurley at an altitude of23 miles (37 km). The meteor was quite bright, rivaling that of the waxingcrescent moon ? a phase of the moon in which the illuminated surface increases,NASA officials said. Calculations that were automatically performed by thetracking software indicate that this cosmicinterloper was from the main asteroid belt, moving in an orbit which takesit more than three times Earth's distance from the sun. Contact information for NASA's Meteoroid EnvironmentOffice at the Marshall Space Flight Center is available here.